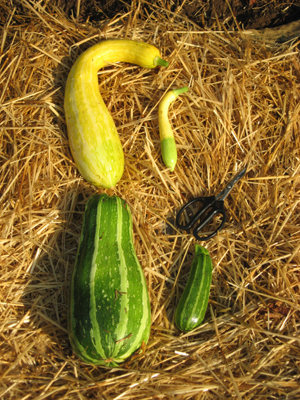 I planted zephyr summer squash and bush-baby zucchini, both varieties meant to be harvested at 4-6″. Tiny. Delicate. Manageable. I did not consider that tiny fruit does not equal tiny vines and tiny leaves. 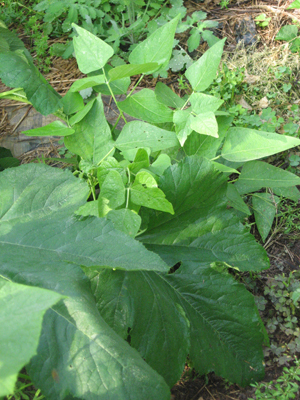 The squash plants are gobbling the garden, and all life is threatened within. I suspect that the deer netting is the next to go, and then on towards my house. If this is my last post, you will know what happened. 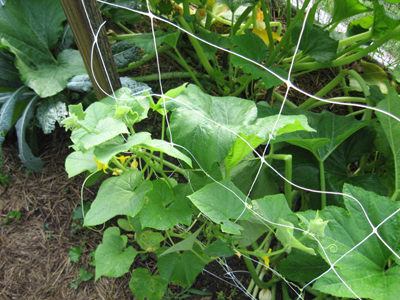 At first glance, this looks like cucumber vines merely struggling to gain purchase on wobbly plastic trellis netting. 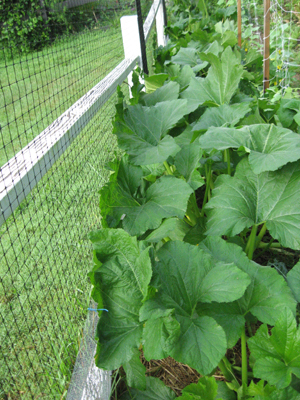 Closer look at the squashes planted next to the cukes: When they're not shoving the cucumbers, they're piling up against the front fence. A longer view of the crush. Planting lima beans at the end of the squash row? The limas think this was poor planning on my part. To the right: dinner. To the left? Doorstops. One final shot, to offer perspective. 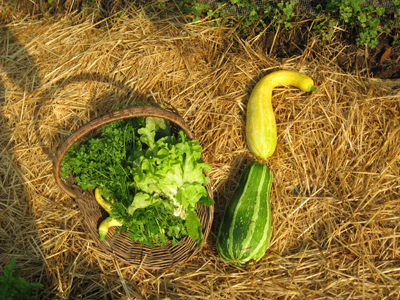 Please note: my harvest basket is large, but not large enough for that day. Solutions? 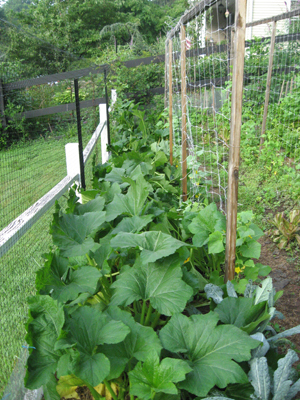 Short-term: Struggle down the rows each day, lifting leaves, harvesting youth. Long-term: plant something else next time. Squash has me thinking a lot about location, and of course I was reminded of the classic advice for purchasing real estate: The three most important factors when buying? Location, location, location. 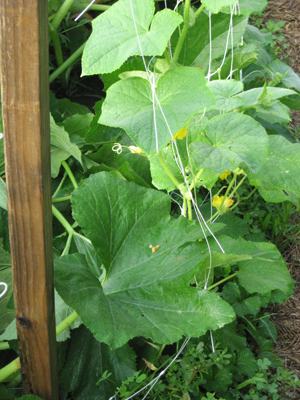 Since you can only eat so much squash anyways, try chopping off the new growth. I’ve kept my pathways clean that way. I still have plenty of stuff. Now don’t stand anywhere too long though—you’ll get swallowed up-LOL! Great idea, and I will try that Susan. Thank you! I need to regain at least a sense of mastery over those rows. And I will absolutely take your advice to be quick on my feet! Darn! Wish I still worked with you. I’d help out on the squash front by eating all those doorstops! I love squash! Next time I come over to my mom’s I should let you know in advance so I can pick up some from you. Hi Amy! Here’s another solution: set up shop at a local farmer’s market! Or, share a delicious squash recipe with me. =) The scramble for real estate … I love it! Hi Kate — in fact, I have a wonderful recipe for Zucchini bread, and one for Zuccanoes….I will do a post soon, just for you! And I have thought about your farmer’s market idea. Very intriguing, and I would love to be a part of that life. Amazing information. Gorgeous ideas and images. Grateful that you are here for us neophyte planters (well, me anyway). Chop it all up and throw it into a lobster pot with olive oil and all those crazy tomatoes; add garlic and onion and simmer. Serve with rice or pasta! Yummm….. then go to bed smiling in peace. Now THAT sounds like a recipe for a lovely meal and an even better night’s sleep! My mother used to say, “A clear conscience is the best pillow,” but I think your “lobster/squash/olive oil and garlic” plan is equally suited to “the best pillow” and doesn’t come with a side-helping of guilt! !